Moving residence can often be a traumatic experience, if done without planning and taking on the experience and knowledge of furniture removals professionals. Only the extremely brave hearted or the foolhardy would think of undertaking the mission of moving from Port Macquarie to Melbourne all by themselves and tackling the complexities of pre-packing, arranging for moving boxes or storage units, finding a truck to hire; more so when the services of professional interstate removals like Roadways Furniture Removals are easily and economically available. 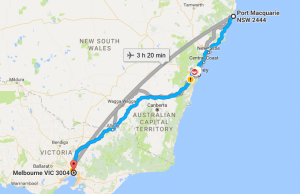 Roadways – Making Relocation a Breeze for all your Port Macquarie to Melbourne removalists. Should you decide to pack on your own, go ahead! We’ll arrange for all the moving boxes you may require and will also advise you regarding the best way to pack to minimize the possibility of damage. You could also just lie back and entrust the tedious job to us – our team of expert packers will take care of packing all your belongings. Pricing is simple and by the box; our cost estimate will surely delight you. We work so that you don’t have to. Our end-to-end pre-packing and unpacking service ensures that you can leave your current home in our expert hands and walk into your new home with your belongings all unpacked and properly set up for you to enjoy immediately. Even if your shipment is only a single box or a few items that would not require a full truck, we can help out with our interstate backloading services. We will normally be able to accommodate your request on any of the trucks that may have some space available. Even substantially large backloading requirements may also be met in this manner. While we are specialists in personal effects removals, many of our clientele belong to the commercial sector and depend on us for shipping of furniture, equipment for trade shows and exhibitions, dock-to-dock transport for export / import goods and office relocations. Trust us and you won’t be disappointed. We have a huge range of furniture storage options available, and we are also allied with a network of storage facilities throughout Australia. This enables us to cater to all conceivable requests for storage with cost-effective limited access to premium unlimited access options. We have a range of custom designed piano removals trolleys and cradles to guarantee the maximum protection for your prized possession during transport; we can transport pianos of all types, styles and sizes; from the average upright to a concert grand piano. If you are not planning to drive to your new destination, you can entrust the transportation of your car to us without any qualms. Your vehicle can be delivered to your doorstep using our vast network of professional vehicle transport service agencies and interstate car carrying specialists. As the best, Port Macquarie to Melbourne removalists, our network of specialised furniture removals covers all destinations in Australia. Call us today to get started!